The components are decent and the machine is well-made, but Nvidia's graphics core just can't properly deliver 4K gaming. 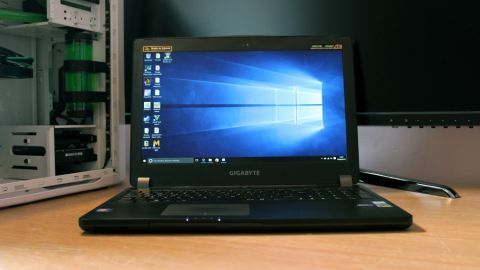 Gigabyte's P35W v5 gaming laptop costs a reasonable $1,877 (about £1,300, or AU$2,599), but the firm has packed an awful lot in: high-end Nvidia and Intel hardware, an M.2 SSD drive and a 4K display so that you can chew through all of the dazzling titles on our best 4K games list. In theory, anyway. The P35W's modest price means this isn't the best-looking gaming laptop. Its metal body doesn't show off with bright lights or dramatic design: it's dark and plain, with sensible angles and a few unsightly seams. It's not as striking as the Aorus X5 v5 or the similarly-priced Acer Predator 15. Build quality is middling, too. There's give in the wrist-rest on either side of the trackpad, and pressing the screen caused the desktop to distort. I heard creaks when putting pressure on the base panel. However, the P35W fights back on the scales. It's 0.82in thick (21mm) and weighs 5.3 pounds (2.4kg) – slimmer and lighter than its rivals. The Alienware 15, for example, weighs 6.6 pounds (3kg), while the Predator 15 weighs a mighty 7.4 pounds (3.4kg). In comparison, the P35W is a good traveling companion, although I'd use a protective sleeve when carting it around for added protection. The P35W has three USB 3.1 ports and a USB 3.1 Type-C plug, an SD card slot and HDMI, D-SUB and mini-DisplayPort sockets. It's got a DVD writer, too, although interior access isn't much cop – you can get to the memory sticks, but that's it. The speaker grille sits above the keyboard. Laptop audio is often an afterthought, but here it's good: punchy and clear, with decent detail across high and mid-range sounds. There's not much bass, but that's no surprise – there's no subwoofer. The P35W isn't going to do your next house party much justice, so consider going for a dedicated speaker set for your entertainment needs. The keyboard's base is firm and the typing action is impressive – the Gigabyte's keyboard isn't far away from the snappy, pleasing consistency of Apple's 13-inch MacBook Pro. The keys are consistent and fast, with reasonable travel for a unit with chiclet-style spacing. That's good, but the keys are a tiny bit softer than the best chiclet units. And these low-travel, fast-reaction units don't match the speed, depth and feeling of a proper mechanical keyboard. But then, there's nothing stopping you from adding a mechanical gaming keyboard into the mix. If you're feeling really brave then there's always the MSI GT80 Titan. It's good to see full-size Return and space keys, but I'm not a fan of having cursor keys crammed up against other buttons. There aren't any macro keys, either. Two buttons are built in to the trackpad. They're decent – fast to respond and with a shallow, rapid clicking motion – but they're noticeably softer than a proper gaming mouse. Serious gamers will attach a USB rodent.